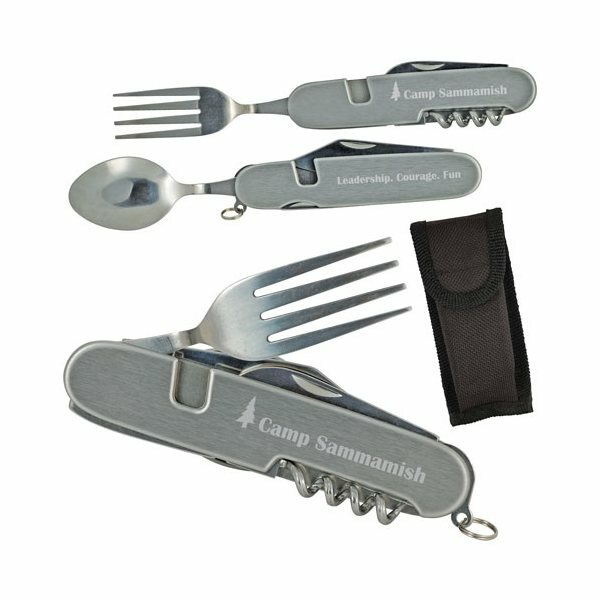 2-3/4" blade knife, spoon, fork, corkscrew, bottle opener, can opener in one. Fork and knife/spoon can be separated for convenient handling during meal. Nylon pouch with belt loop. This was a hit for us to the point that we had customers email us for another one so they'd have a pair. Unique item that customers really likes. Everybody thought it looked great. Exactly what I hoped for. Great color, Large imprint. An enormous hit within my group.